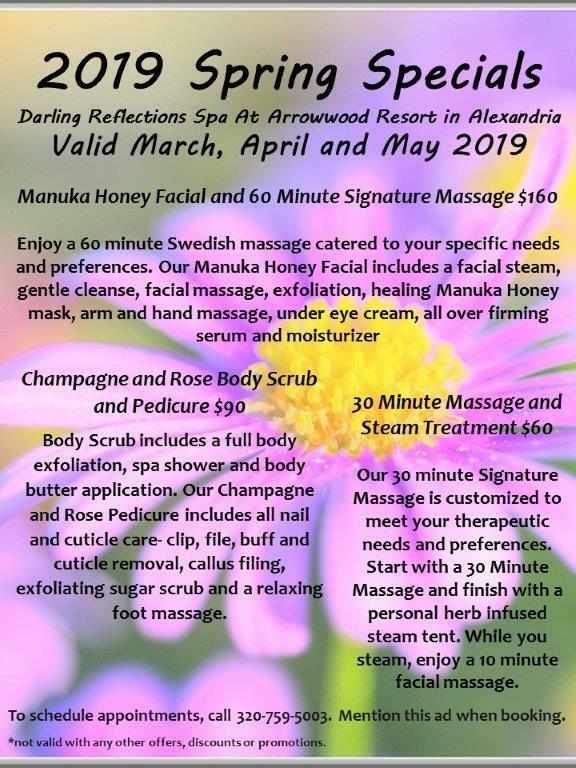 Immerse yourself in the Darling Reflections Spa experience, where you can find the harmony and balance of the lake lifestyle at its finest. Located in the main resort building near Lake Darling, the mission of the spa is to reflect the beauty and serene atmosphere of the lake while providing the highest quality treatments. The spa is open to both resort guests and the public. Please make all appointments in advance by calling (320) 759-5003. For a full list of our services and pricing, please view our brochure. We offer a list of spa specials & packages each season. Please give us a call to hear our current specials, and be sure to mention the name of the special when making your appointment. Darling Reflections Spa is located on the third level of the main resort building, across from the indoor swimming pool. Bridal showers & bachelorette parties. Pamper the bride-to-be with the luxurious getaway she deserves. We’ll even help you with the planning. For more information, contact us or call (320) 759-5003.